Height (bottom to top) 32"
Storage CENTER DOOR OPENING: 19 5/16" x 18 1/2" x 16 3/4". CENTER SHELF: 19 1/4" x 15 3/4" x 5/8". MEDIA OPENING (2): 17 1/2" x 18 3/16" x 5". SIDE DOOR OPENING (2): 7 13/16" x 18 1/2" x 16 3/4". SIDE SHELF (2): 8 7/8" x 15 3/4" x 5/8"
The richly detailed mission design of the 42 inch TV stand captures the beauty of rich country style with a versatility that enhances any living room area. The medium brown oak stained finish is beautifully accented by the mortise through ornamentation to create the rustic beauty of finely crafted mission styled furniture. 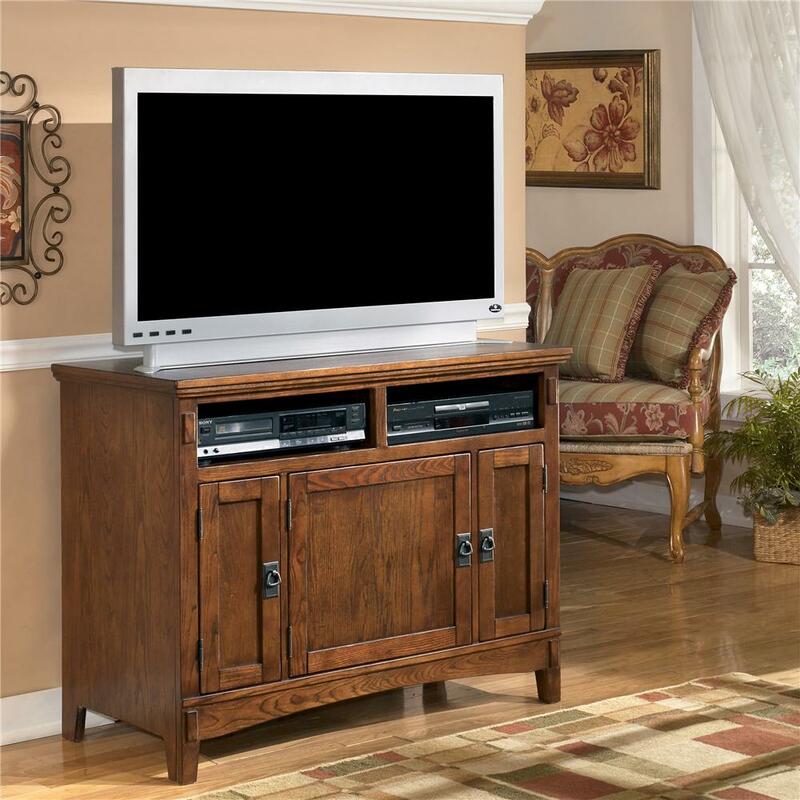 With framed doors, featuring mission styled overlay slats, that open to ample storage areas and cast hardware finished in an aged bronze color, this TV stand perfectly enhances any living environment.